Long ago, the American automakers ceded the small truck market to the Asian manufacturers. 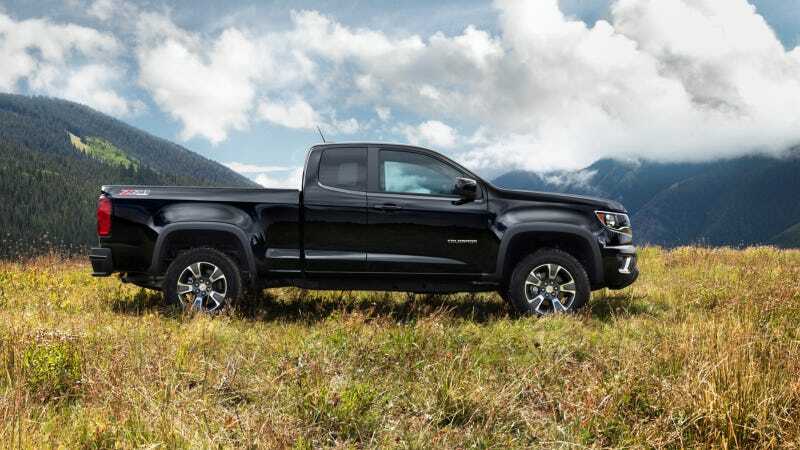 Now they want it back, and the 2015 Chevrolet Colorado is a great start. It's the small diesel truck we've been dreaming about. Here's what you need to know: with either two doors or four, it looks great. It's one of the most stylish and modern-looking trucks ever made. I'm a huge fan of that gently curving hood and front grille. All trucks should look this good. But it's a truck, so what matters most is what's under the hood. Chevy says they'll be offering the most powerful truck in its segment, starting with a 2.5-liter inline four with 193 horsepower and 184 pound-feet of torque. They say 90 percent of the peak torque will be available from 2,000 RPM to 6,200 RPM. There's also a 3.6-liter V6 with 302 horsepower and 270 pound-feet of torque. What we're most excited about, however, is the diesel. Sadly we won't get it until the 2016 model year, but it sounds pretty good. It's the 2.8-liter turbo four offered in global markets, where it puts out 200 horsepower and a whopping 368 pound-feet of torque. No word from Chevy on its U.S. power output, but that's a good start. But can it truck? Truck yeah, it can truck, according to Chevy. Its configurations are an extended cab model with a 6-foot bed, a crew cab with a 5-foot bed and a crew cab with a 6-foot bed. With the tailgate down, the 6-foot bed allows hauling of 8-foot-long items. WT, LT and "off-road inspired" Z71 trims are available, all in 2WD or 4WD. Sadly, the only transmission mentioned is a six-speed automatic. I hope a manual becomes an option too at some point. Other goodies include an available EZ Lift-and-Lower tailgate that uses an internal torsion bar to make raising the tailgate easier with one hand, standard two-tier loading that allows a platform to effectively split the bed into upper and lower sections to haul and conceal items like tools, and 13 standard tie-down locations with movable cargo tie-down rings, and standard bed rail and tailgate protectors. "When properly equipped," they say the Colorado is expected to offer payload capacity and trailering capacity of more than 6,700 pounds, which Chevy says is more than enough to tow your favorite boat to your favorite lake. And since nobody apparently buys stripped-down beater trucks anymore, it's quite nice inside too. Interior features include an 8-inch touch screen, multiple USB drives, a 3.4-inch diagonal driver information screen in the instrument cluster, next-gen OnStar and MyLink with voice recognition, and available navigation. First for trucks of this class, there's also forward collision alert and lane departure warning. Neat!